With the Insanity workout program, Shaun T proved to the world that you do not need workout equipment to get extreme results. 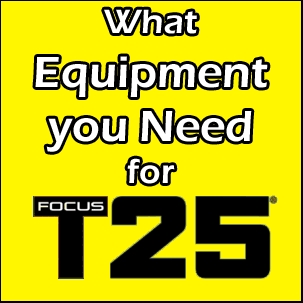 And with the introduction of Focus T25, he has clearly demonstrated you do not need to devote a lot of your time either to get the results you want. The amount of equipment for Focus T25 is minimal. You really only need resistance bands or dumbbells and a mat. The miniMAT is a piece of equipment that the program recommends. If you are exercising on a hard surface, a miniMAT from Beachbody or other type of yoga mat will really make your workouts much more comfortable. A chin-up bar is another optional piece of equipment, but it is only used in two of the Gamma phase workouts shown below. The goods news is that the T25 base kit (Alpha and Beta phases) comes with a B-lines resistance band, so there is no equipment you need to buy separately if you don’t own a set of dumbbells. A good beginner dumbbell set of 3 to 8 lbs should be a good starting point. And, when you need to increase the weight try holding two dumbbells at once to increase the intensity. Are we talking about Skoda T25, german premium or T25 Pilot 1? Something totally different….Actually a workout program from Shaun T and produced by Beachbody. Can you please tell me what Nada means? thank you for answering my question. I have done the original insanity. I am looking for a weight training program that I can hybrid with insanity max30? what do you think about p90x? I finished insanity max30. Is t25 the way to go or will it be too easy after doing insanity max30? Hi guys I bought t 25 yet to start. I had throat op .and have lost to much weight. And muscle tone especially legs.my question is any one will it help to bulk me me up and put back muscle tone . Good evening. I ‘m Portuguese and I have followed the T25 program. I’m starting to BETA , my question is about the Dumbbells that I use . What weight should be ? HI Jorge, It depends upon on your fitness level, most men should be able to start with fifteens. what’s Nada Guys? can anyone provide a photo to get it clear ? Hi Kamal, Nada stands for nothing. I’m looking at purchasing the resistance bands from this program to use with another Beachbody program. Would you happen to know the length of your resistance bands? Ho Britney. I believe it is 48 inches. Hi Bethany. I just finished the alpha series and I’m on to beta. I just ordered gamma so I’ll have it when I’m down with beta. What weights should I have? I prefer weights over bands. Thanks! I started this work out yesterday, and just completed DVD 2, which I can say I just about managed. Co-ordination is my issue, and balance, due to a past ligament injury in my left foot. Otherwise I’m good, it’s a great start and I’m hoping next week I will be better at it. Sweating like hell but worth it. Thanks Shawn. I’m considering starting the T25 program, it’s the first thing like this that I will tried so it’s all new. I go to the gym but am struggling to shift body fat from my stomach and chest so hoped T25 might be the key! I’ve read that there are diet suggestions but can’t seem to find any examples, I work as a sales rep so meals are eaten out and about, do you think this will fit my lifestyle and are the meals realistic without being a nightmare to prepare? Hi! I find your posts very helpful so thanks for that! I wanted to ask you, how to know what kind of resistance band and dumbbells do I buy? What weight do I use? I’m not a complete beginner, I pole dance twice a week, but I really need to get into shape and lose some weight I gained during the break I took because of the injury I had. I just started t25 earlier this week on sunday . Definetly work up a sweat each time during a workout . Ive always wanted to try a workout program and this seems to be the one.